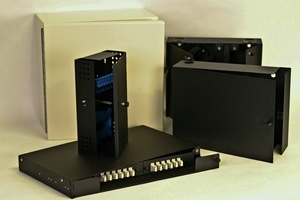 Fiber optic enclosures are designed to provide connectivity and distribution solutions for fiber optic cables. Well-organized fiber optic cable distribution not only keeps the fiber optic components accessible, but it also increases performance and it reduces opportunities for damage. Enclosures come in different configurations such as rack mount, wall mount, and indoor or outdoor. Our enclosures are made from powder coated steel and come in different dimensions and capacities. An enclosure is typically installed to bring a long distribution cable into a user area. By terminating the distribution cable or "backbone cable" into the enclosure and running fiber optic patch cables between the enclosure and the individual equipment, it will reduce opportunities for damage to the more critical backbone cable as users connect or change equipment.